I was thinking about some knife based Martial Arts, mostly Filipino based, that entertain the concept of “biomechanical cutting”. There can be some confusion with the term depending on the art or the practitioner, but the essence of the concept is the intentional cutting of muscles and connective tissues in the limbs so as to cause loss of function. Some artists have taken the idea as far as employing a blade as an almost “less than lethal” tool in a self-defense situation. They think they can use a knife to disable limbs while not killing…or intending to kill…an opponent. In theory, I have nothing against “biomechanical cutting”; if your defensive techniques feature limb attacks and those cuts actually do disable limbs in a self-defense situation so much the better. But I question it’s efficiency as a “primary technique”…I will cut up his limbs so I wont have to kill him. That seems to assume an almost “fantasy level” of technical and physical dominance in a fight where you felt you had to employ a knife. If you are going to argue that you were in such fear for your life that you had to draw a blade and you then went on to fillet the guy at will….I could see an attorney attacking that. 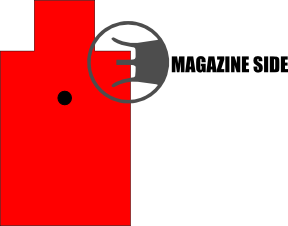 I see stabs as the analog of center of mass firearms hits and “slashes” like limb hits. Sometimes you may shoot at a limb intentionally because that’s the only target you have. If you are shooting from under a car and disable a guy with leg hits great…it was all you had and it worked. Developing a firearms technique that intentionally focuses on limbs as a “less lethal option” is fraught with issues. A gun is NOT a “less lethal” tool no matter where you shoot someone. Think otherwise and I think we start to wander into the “why did you kill him? Couldn’t you have shot him in the leg or something?” territory. A knife is a deadly force weapon. I don’t know if I’d be willing to be a test subject for a legal argument that it can be employed as a “less lethal” tool. Even limb slashes can kill via exsanguination. In conclusion, my personal opinion on knives as a “defensive tool” is that if I have to use one its going to be in a “kill or be killed” situation, and the best way to survive such a threat and sustain a legal defense, is to employ it as such. AR 15 Armoring. Replacing a bolt catch. The AR Platform is probably THE most modular of long gun’s out there. There seems to be no end of parts, upgrades and do-dads available for it. 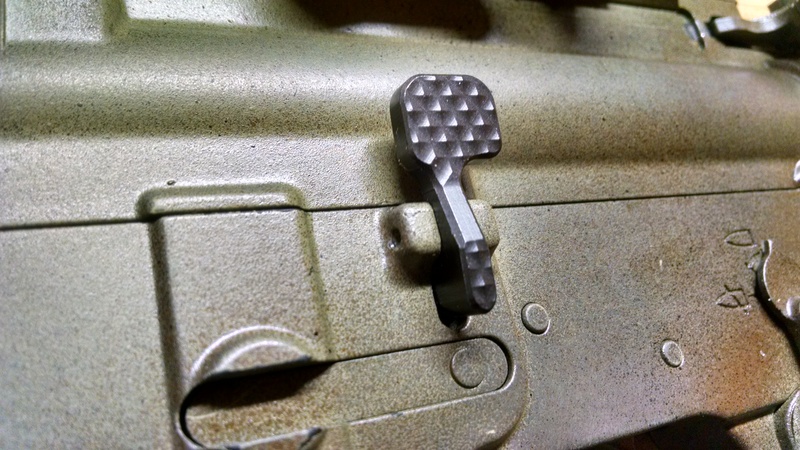 While there are MANY people out there with the armoring know how to replace their own parts or upgrade/repair their AR’s, there are others who are a little hesitant to take punches to their “baby” and get to work. 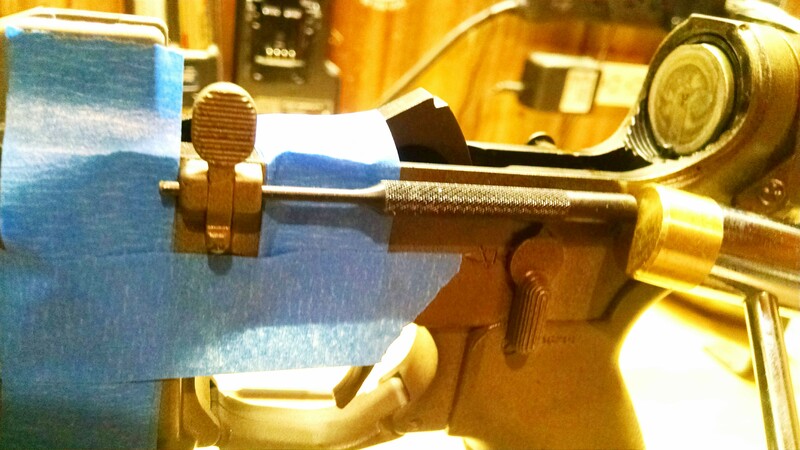 This post is to show how easily one can replace the bolt catch on their AR…it’s nothing to be scared of. 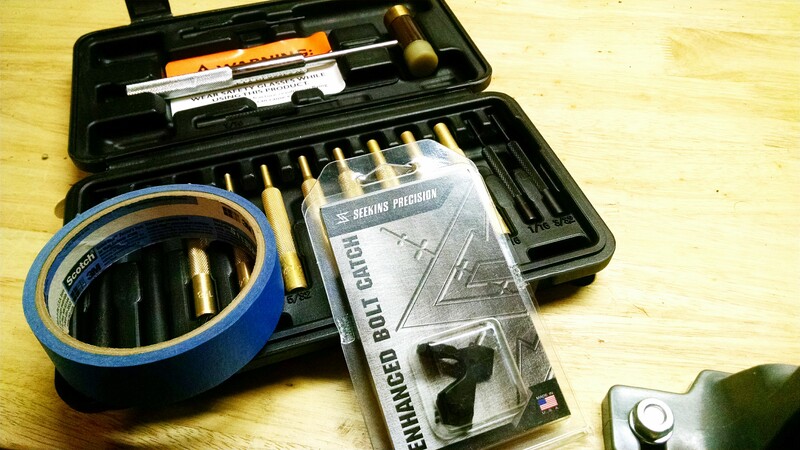 Today my Seekins Precision Enhanced Bolt Catch arrived. It offers a larger “paddle” for bolt manipulations, has a textured pattern for positive control and…yes…I thought it looked cool. IMO, if it works as well (or better) than OEM then I have no problem with making a choice based on appearance. Anyway. First thing you should do is get your work-space prepared. For this job all you need is two 3/32″ punches, a hammer and some tape. 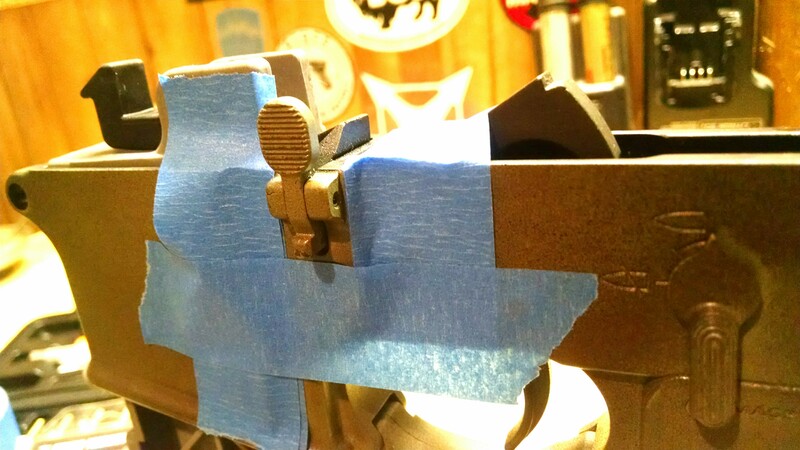 After securing your lower in whatever block/vice you have, I suggest a layer or two of non-marring tape around the area you are working on to protect the surface from any scratches. 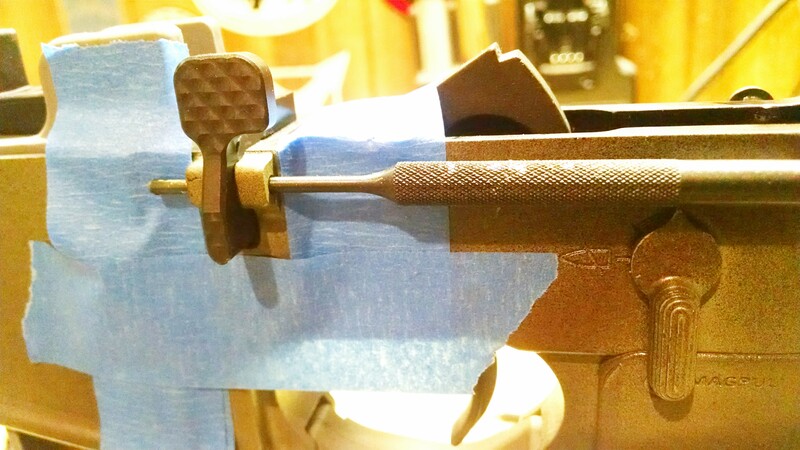 Using a 3/32″ punch and hammer, slowly tap the roll pin securing the bolt catch out. Since this is a replacement job I recommend not driving the roll pin all the way out. Just tap it till the old bolt catch can be removed. Be sure to retain the bolt catch spring and plunger for re-installation. Now it’s “in with the new”. 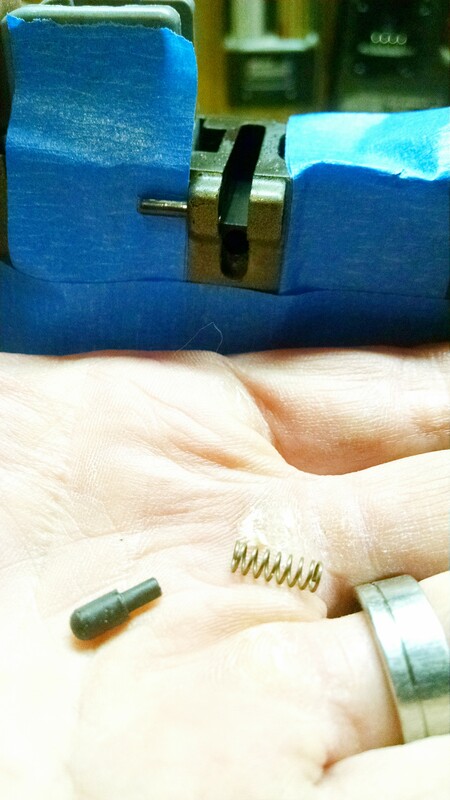 Push the spring back into the receiver, followed by the plunger. 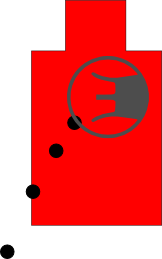 Now, temporarily secure the new catch by pushing a second 3/32″ punch through the flange on the lower receiver and the hole in the catch. 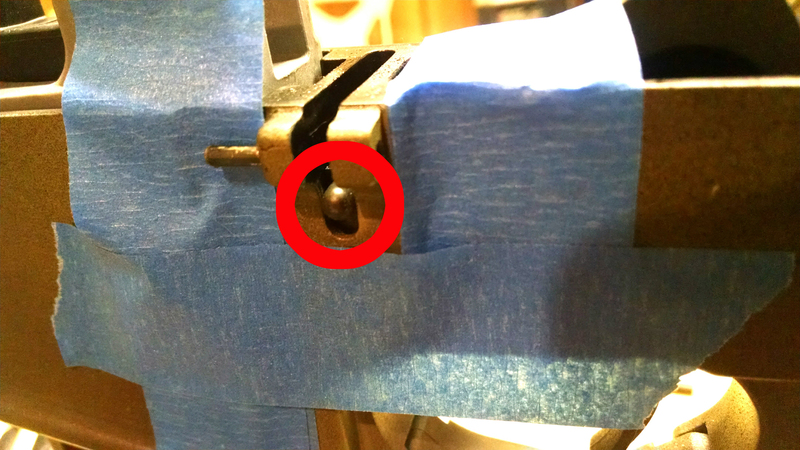 Then all you have to do is simply reverse the process by tapping the roll pin back into place. Viola! That’s all there is to it. Someone explain it to me. I don’t drink his kool-aid, but I don’t hate the guy’s stuff either. Is it jealousy of his success? Is this some sort of “sell-out” thing, like some folks point at musicians when they go commercial? Sure, this video is a tad loopy, but it’s Airsoft in Japan and they wanted him to do this for a photo-op. I see a lot of OMG HE’S FLAGGING PEOPLE WITH A GUN!!! going around. But it really looks like he’s pointing over everyone’s head at the far wall. And correct me if I’m wrong, but people actually point and shoot Airsoft at each other all of the time don’t they? What’s the story with the hate on this dude? He’s certainly bought the AR platform some attention. There’s a great post over at Moderno.com about the Temple Index. Yes, that “gun by the head” pose that many range instructors will have a cow over….there are times when it’s the best thing available. Go read it and tell me what YOU think. Every samurai who is in service must have a supply of weapons suitable to his means. Every feudal house has its military regulations, and the proper banners and flags and helmet insignia, spear mounts, sleeve crests, and marks on the baggage animals as ordered by the lord must be carefully provided in a uniform manner. For if they have to be improvised in a hurry it will be an obvious sign of carelessness and will provoke contempt. Men who from neglect of these insignia have been attacked by their own side and killed and suffered loss are not unknown in military history, so there must be no want of precaution in these things. And some may think that their servants are not likely to have to cut anybody down and so may replace the blades of their swords with wood or bamboo, and neglect to provide them with a loincloth because they think they will not need to gird up their clothes, and find themselves in difficulties owing to their want of foresight. 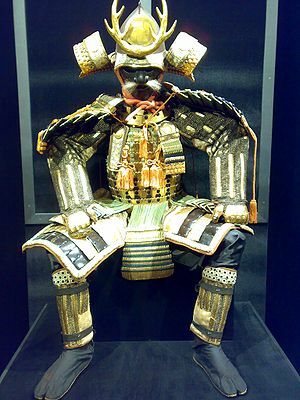 And a samurai who is a cavalier and who receives a considerable stipend and who does not know when he may have to take the field, however peaceful the time may appear to be, is a hundred percent more culpable if he does not provide himself with the proper weapons than the young serving man with a wooden sword or no loincloth. So from fear of being put to public shame he ought to equip himself properly. And here is a piece of advice on the subject. When a small retainer wishes to fit himself out with armor and has, let us say, three pieces of gold to get a suit, the best thing he can do will be to spend two-thirds of it on the body armor and helmet, leaving the remainder to provide all the other things he will need such as underclothes, breeches, coat, under-hakama, upper girdle, surcoat, whip, fan, wallet, cloak, water-bottle, cup, etc., so that he will have every accessory he needs as well as his suit of armor. Then, though he may be young and very strong, it is better to avoid heavy suits of thick iron armor and weighty banners and standards, for the very good reason that, though they may be tolerable while he is young and vigorous, as he grows older they will become too much for him. And even a young man may fall ill or be wounded, and then the lightest iron armor will be a heavy burden and a hindrance. And if a young man gets known for the weight of his banners and standards he will find it difficult to give them up when he becomes older and less able to support them. I find it an interesting parallel to modern soldiers and law enforcement officers who will spend tons of money on the latest flat-screen or video console but will scrimp on buying a quality holster or flashlight. the M4 unreliable….here we go again. I won’t rehash the article and I won’t even type my response to it because THIS GUY has already said everything I would have to say. Three days ago an article was dropped onto the internets by the Washington Times that rippled through the time space continuum of internet commandos and pajama ninjas. 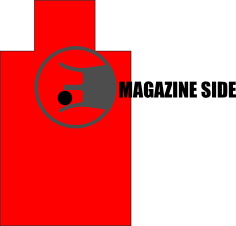 The article was a series of interviews with former and active high ranking officials, as well as former service members regarding the reliability and efficacy of the longest serving weapon system (rifle or carbine) in US Military history. We do not need to address that storied history here, however we do need to address the concerns raised in the article and the already common ways they have been addressed and remedied. Like any topic of a technical nature, “best” is a relative term. For the beginner, what you need to learn are some simple rules of thumb to help you base a decision on. Gun makers realized rather quickly that the accuracy of a firearm improved when the projectile had a “pointy end” and was spun. The “point” gives the projectile a streamlined shape that slices through the atmosphere more efficiently and groves machined into the gun barrel impart spin. 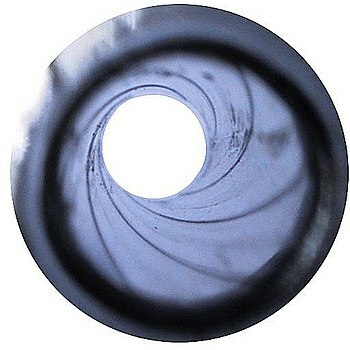 The spin keeps the bullet stable along its path of flight and prevents it from wobbling or tumbling end over end, both of which would be bad for accuracy. Anyone who has used a gyroscope in HS science class recalls that a spinning object likes to stay in one place and resists change. That’s what you want in a bullet. The groves in the barrel, as we all know, are called “rifling”. A rifle barrels rate of spin is expressed as 1:(X) with 1= “One full 360 degree rotation of the bullet” and X= Inches of barrel length. 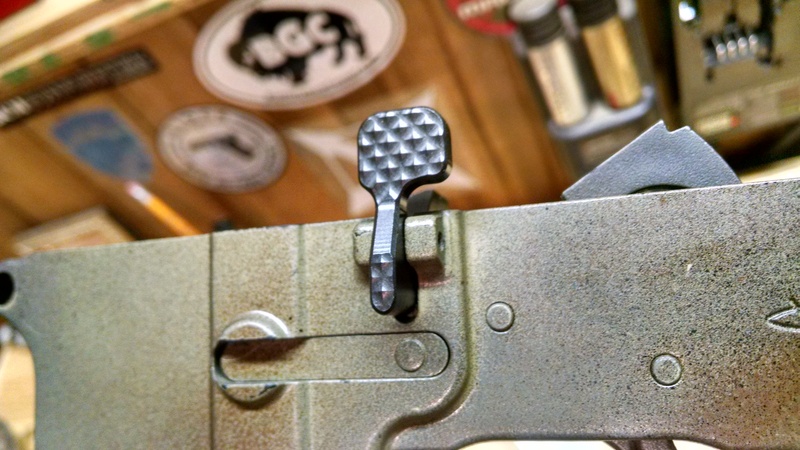 The most common “Combat AR” twist rates you will find “off the shelf” these days are 1:7, 1:8, and 1:9. Some AR owners like 1:10 and 1:12 barrels and other variants, but in my experience you will find most guys who “run and gun” using one of these three. If you do the math of dividing barrel length by twist you see that in the common 16″ barrel length a 1:7 twist will spin a bullet twice with 2 inches of the barrel still to go. 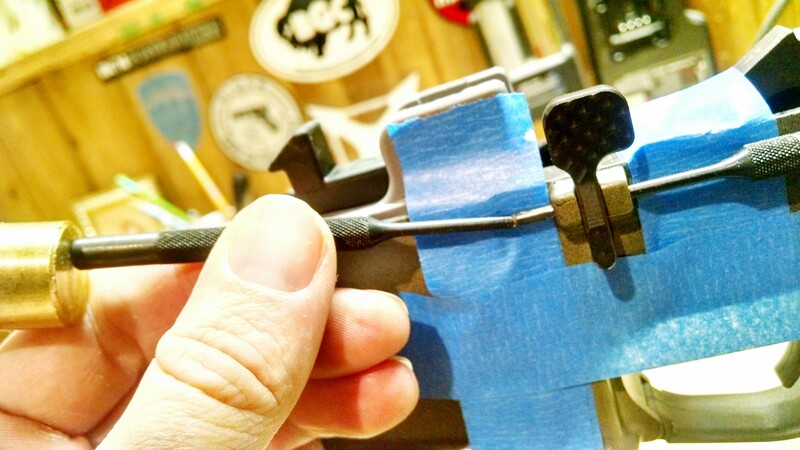 A 1:8 about twice even, and a 1:9 will spin it once with 7 inches of barrel to go…so “almost twice”. Based on manufacturing variations that’s all approximate but there you go. So “whats the point?” you are asking? Well… bullets of any given caliber (AKA: diameter) come in various sizes. Differentiated by weight (measured in “grains”), there is an entire rainbow of .223 caliber bullets ranging from tiny 40 grain bullets up to 80 grain whoppers. 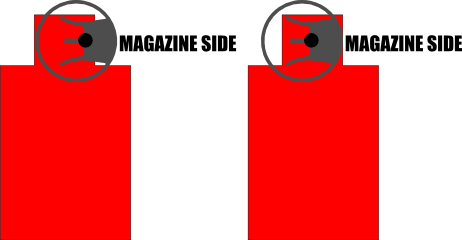 Because the diameter of the bullet is fixed, what you get are longer projectiles as the weight increases. Lighter bullets can achieve faster velocities and shoot with a flatter trajectory. Their lack of mass means they wont stay stable at longer ranges and wind has more effect on them at long range. Heavier bullets will stay stable over longer distances but have a more “arched” trajectory. Wind has less effect on them at long range. The terminal effect of a bullet, or its “striking” power, is due to a combination of it’s mass and velocity. Like barrels, for the purposes of discussion I will use the three most common (as I see it) bullet sizes; the highly common 55 gr, the “medium” 69 gr and the “large” 75 gr. Due to a lot of math/physics and stuff I can’t explain, it’s really the length of the projectile and it’s velocity that determine how much spin it will need to fly straight and stable, not the weight. However, we talk about bullets in “grains” so when pairing bullets to rifling twist you just have to consider two facts. Lighter bullets need less spin to get them into a stable flight. Heavier bullets need more spin to get them stable in flight. So..1:7 is 2 full twists plus a little more out of a 16″ barrel which means MORE TWIST and a 1:9 is 1 full twist which means LESS TWIST. The 1:8 splits the difference. You would think that “more is better” when it comes to twist, but what happens when small/light bullets are overspun is that they fly to pieces once they exit the barrel. Heavier bullets will “overstabilize” if spun too much. That means the point of the bullet wont come down on the decent end of it’s trajectory. So which should you get? Well what do you want to do and what size bullet do you want to do it with? The 1:9 is a common twist rate “off the shelf” when you buy an AR. It will work fine with the commonly found 55 grain bullet up to “medium” sized projectiles like 69 grain. Depending on your particular barrel it MAY even stabilize “heavy” bullets…or it may not. Even if it does, variations like temperature and air pressure MAY make it inconsistent with heavy rounds. So out to 300 yards or so 1:9 should be fine. 400-500 yd shots? Probably not so much. The 1:7 is the current military standard on the M4/M16 and as such is also a commonly found option. It will throw the medium to heavy rounds out past 300 yards. 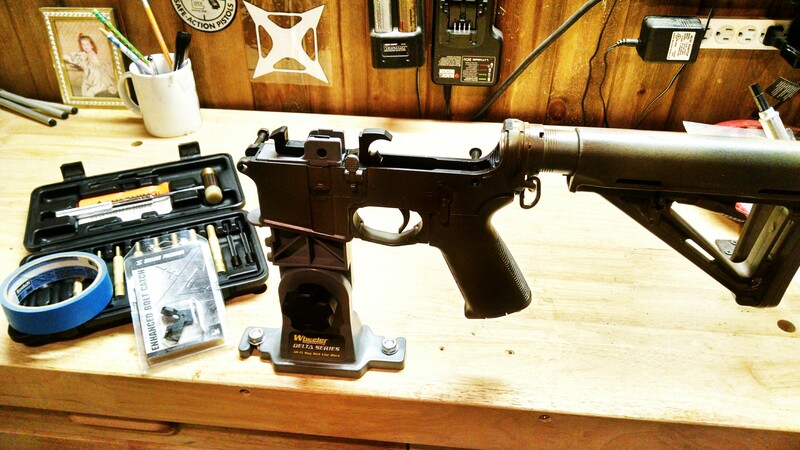 It can also “sufficiently” stabilize 55 grain rounds. You wont get exceedingly small groups with 55gr, and while it MAY stabilize a lighter round for farther shots, you are also at the mercy of your individual barrel and environmental factors. The 1:8 slides the options to the center. Some praise it as the best of both worlds while others deride it as the “Jack of all trades, master of none” option. As you can see, in the end all of them can work fine as a general use option. It’s when you want to specialize in a specific range or hunting environment that a specific combination of bullet/twist becomes the optimum choice. 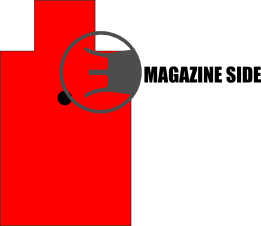 Seeing how popular my NY Knife Law post is I’ve decided to start writing some short articles that will attempt to clarify some common, self-defense related, legal issues. Let me make a few things clear first. I am not an attorney. This is for informational purposes only and is NOT to be mistaken for legal or professional advise. Any opinions I write here are my own and do not represent the views of any agency that employees me. If you have any personal legal concerns, contact a qualified attorney. I’m from New York and am only familiar with NY Law. These writings are based on that experience. Other States have different laws but many similarities at the root. Any discussion of self-defense related legal issues must focus on your particular states “Justification” section of law. As a rule of thumb, you should look at ANY from of physical or deadly force as illegal per se. In a legal sense (vs a “human right” sense), what makes the use of force in self-defense something you shouldn’t go to jail for is your States “Justification” section of law. In NY that section of law is Article 35 of the NY Penal Law. It’s first subsection explains it’s purpose rather succinctly. In any prosecution for an offense, justification, as defined in sections 35.05 through 35.30, is a defense. 2. Such conduct is necessary as an emergency measure to avoid an imminent public or private injury which is about to occur by reason of a situation occasioned or developed through no fault of the actor, and which is of such gravity that, according to ordinary standards of intelligence and morality, the desirability and urgency of avoiding such injury clearly outweigh the desirability of avoiding the injury sought to be prevented by the statute defining the offense in issue. The necessity and justifiability of such conduct may not rest upon considerations pertaining only to the morality and advisability of the statute, either in its general application or with respect to its application to a particular class of cases arising thereunder. Whenever evidence relating to the defense of justification under this subdivision is offered by the defendant, the court shall rule as a matter of law whether the claimed facts and circumstances would, if established, constitute a defense. In essence what this means is, “I broke the law but I was JUSTIFIED” and therefore exempt from any form of legal punishment. So…if you ever find yourself having to use force in NY to defend yourself your “defense” is Article 35. The word DEFENSE…as in many things legal…has specific meaning beyond your common understanding. In general, a (legal) defense is an argument a defendant raises in an attempt to avoid criminal or civil liability for their actions. In specific there are two different categories of defense. 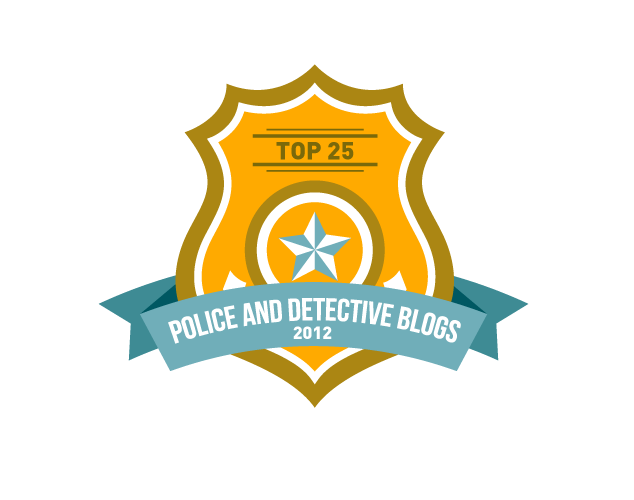 A DEFENSE and an AFFIRMATIVE DEFENSE. A DEFENSE, when raised, must be disproved by the prosecution beyond a reasonable doubt. An AFFIRMATIVE DEFENSE must be proven by the defendant by a preponderance of the evidence. The insanity defense is a common affirmative defense. So. In NY the defense of Justification is a DEFENSE. Once raised, the prosecution has to gather evidence, from an argument, and prove beyond a reasonable doubt that your actions were NOT in self-defense or otherwise justifiable. You do not have to “prove” it. This may vary in other states. This is typically where the discussion of “DON’T TALK TO THE POLICE” comes in. I’m not going to take a hard stance one way or the other here but it’s my personal opinion that you should be prepared to give a basic explanation of what happened to responding officers. A ” he jumped me, we fought, he pulled a knife, I was afraid for my life so I shot him.” sort of response MAY be the difference between going home that day or being arrested on the spot. Giving a lengthy explanation or going back to the station to write a statement without legal representation is another issue entirely.